"I brought my mountain bike with me to the Pennsylvania Grand Canyon, thinking that I was going to try out some of the mountainous terrain, only to discover some of the easiest pedaling and most beautiful scenery I have ever experienced in the same place, the Pine Creek Rail Trail." The Pine Creek Rail Trail is appropriate biking for a wide range of ages and skill levels. You will quite often see families or large groups gathered ready to travel along the Pine Creek Gorge. Some bikers like to approach the trip aggressively, increasing the heart rate by pedaling hard, whereas other bikers prefer to take the more leisurely or low impact approach to riding the trail. Some come to travel the whole distance while others choose to travel just a portion of the trail. The old railroad grade that provides a home for the trail along Pine Creek is a gradual grade, hence making it an easy pedal for those less powerful in the pedaling department. Keeping in mind that starting your trip from Ansonia means that you are first traveling downhill on the grade, it also means that the return trip will be slightly uphill and a little harder pedaling. This visitor has discovered what many visitors to the Pennsylvania Grand Canyon have discovered, one of the world's best biking experiences, the Pine Creek Rail Trail. There are several places to park and begin your ride through the Pa Grand Canyon. One of the most popular starting points is the Darling Run access area near Ansonia, Pa. There is a parking area there. This is near Wellsboro Pa., at the northern mouth of the Pa Grand Canyon which leads directly to the natural wonders along pine creek. One of the favored rides is to start at Darling Run and ride the length of the canyon to Blackwell. This is about 16 miles. Those who plan ahead and who have the means can have a shuttle vehicle at Blackwell, ready to pick up riders and their bicycles at the end of their journey. Provide your own shuttle or hire one of the local shuttle services. Some choose to start their ride in Blackwell, Cedar Run, Slate Run or Waterville, which are at the southern portion of the Pine Creek Rail Trail, the lower end of the PA Canyon. By starting your trip in Blackwell or one of the other more southern points, you can first travel upstream, up the gentle grade of the Pine Creek Rail Trail and then return riding downstream along Pine Creek. This allows the bicycler to travel a distance upstream that is comfortable and then turn around and have the downhill slope of the trail to their advantage, providing a slightly easier return trip. 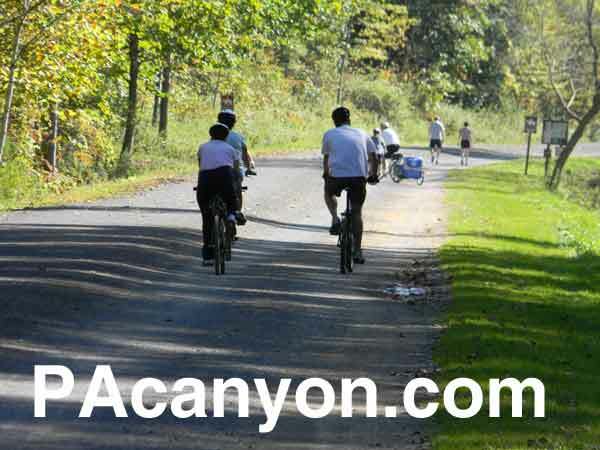 Either approach to your PA Grand Canyon bicycling adventure will prove to be a great ride. The bicycles used by riders on the Pine Creek Rail Trail range from extreme mountain bikes to padded seat cruisers. Any season is a great time for a visit. Some visitors bring along a fishing pole and take advantage of some of the springtime angling, or take time out for a summer swim, or viewing the fall foliage. Many visitors augment their journey with a hike on one of the canyon area hiking paths. Enjoy the Pine Creek Rail Trail year-round. Spring, summer, fall or winter, it's always a great time. And if there's too much snow in the winter for riding bike, be sure to have your cross-country skis with you. You'll not find a better cross-country skiing experience.